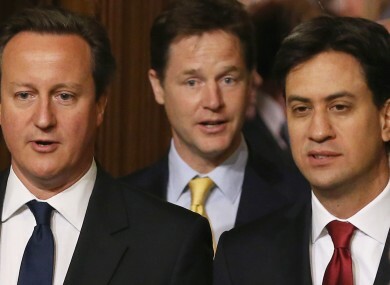 Prime Minister David Cameron (left), Deputy Prime Minister Nick Clegg (centre). THE LEADERS OF Britain’s three main political parties have announced a last-minute trip to Scotland to boost the campaign against independence after a surge in separatist support ahead of next week’s referendum. Conservative Prime Minister David Cameron and opposition Labour leader Ed Miliband agreed to skip their weekly Prime Minister’s Questions – the Westminster equivalent of Leaders’ Questions – in the House of Commons today and instead head north, reflecting a new sense of urgency in the unionist camp. The move has been described as “unprecedented”. The questions will still go ahead, but with other MPs stepping in. Liberal Democrat leader Nick Clegg, the deputy prime minister in the coalition government, will also hit the campaign trail after opinion polls suggest the break-up of the 300-year-old union is now a real possibility. There’s a lot that the political leaders disagree about but there’s one thing that we all agree about passionately and that is that our United Kingdom is better off if we stay together. So tomorrow the right place to be isn’t in Westminster at prime minister’s questions, it’s being in Scotland listening to people, talking to people. We want to be listening and talking to voters about the huge choices they face. Our message to the Scottish people will be simple: ‘We want you to stay’. Speaking to i100, political scientist Dr Ruth Fox said that it was unprecedented that all three leaders would pull out of Prime Ministers Questions. “I can’t think of a similar precedent in these circumstances,” she said. With just nine days to go until the referendum on September 18, the campaign to keep the UK together is scrambling to adapt to a narrowing of the polls, which had indicated an easy victory for their side as recently as last month. A YouGov poll at the weekend put the pro-independence “Yes” camp ahead for the first time, while another on Tuesday put the two parties neck and neck. In response, the three unionist parties unveiled a timetable for the transfer of new powers over income tax and welfare spending to the devolved Scottish government, and said work would begin immediately after a “No” vote. But First Minister Alex Salmond, the leader of the Scottish National Party (SNP), dismissed the initiative as a “back-of-an-envelope non-plan”. And he said the “extraordinary, last-minute” trip by Cameron, Miliband and Clegg would not help their cause. “The ‘No’ campaign think that they are losing this campaign — and these hugely distrusted Westminster leaders trooping up to Scotland is only going to boost that process,” he said. Cameron’s Conservatives are not popular in Scotland — they have just one Scottish member of parliament out of 59 and he is trusted by just 23 percent of Scots, according to a recent YouGov poll. Miliband’s Labour party has a stronger presence Scotland, but he has the same dismal personal rating. “The message of this extraordinary, last minute reaction is that the Westminster elite are in a state of absolute panic as the ground in Scotland shifts under their feet,” Salmond said. Email “UK leaders take "unprecedented" step to boost Scottish campaign”. Feedback on “UK leaders take "unprecedented" step to boost Scottish campaign”.